This destination winery is nestled in the hills above St. Helena at 2100 ft. above the valley floor. The map they provide is crucial for your visit. Our advice is follow it to a T! It’s something akin to “turn right at the old stump then make a left at the crooked oak”, so it’s a leap of faith adventure. But the drive is lovely and surprisingly brief, and it leads to you a quiet winery tucked away among the mountain mist. Our visit began with an intimate tour of the facility and an up-close look at the barrels themselves. 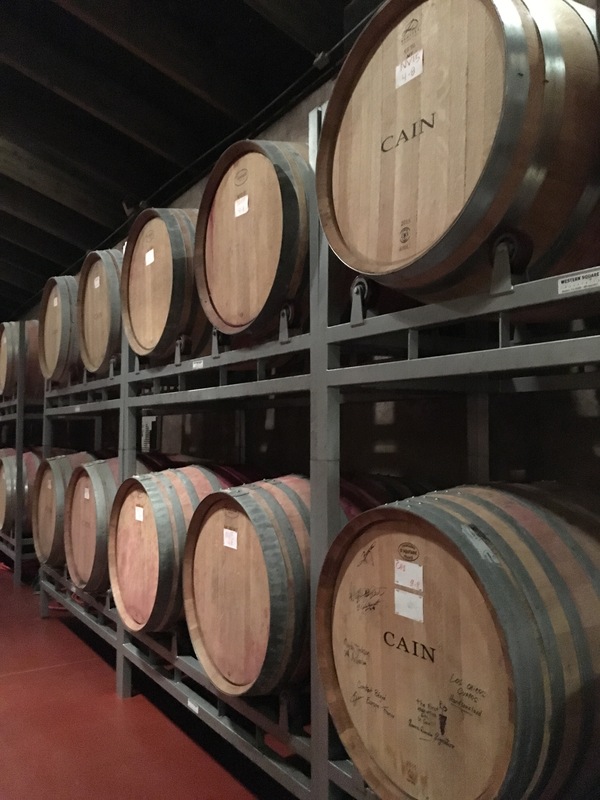 Surrounded by the palpable aroma of French oak, we were educated by our guide on the wild yeast and unique locale that make Cain wines so special. Later on we sat down to a relaxed tasting of Cain Cuvee, Cain Five, and Cain Concept. All fantastic wines, but we are both partial to Cain Five for its earthy tones of moss and wet leaves, as well as the berry and plum flavors that resonate in the glass. Cain strives to let the vineyard shine through so that one can truly “taste the place” the wine represents. A tasting at Cain is an intimate affair, so be prepared to make some small talk and comment on your impressions of the wine. The dining room in which tastings are held is warm and homey with decor that’s a bit dated. 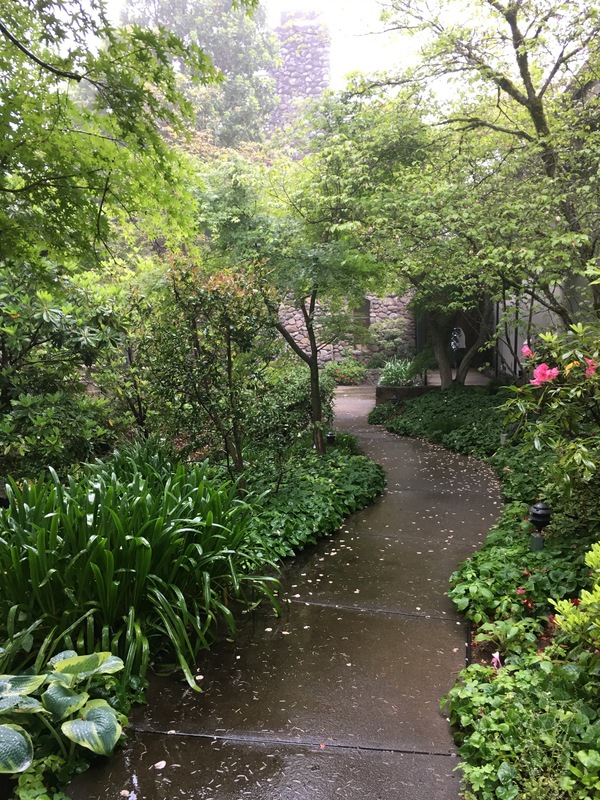 We happened to tour on a rainy morning so our views were somewhat obstructed by the fog and drizzle. We plan to return on a clear day so we can get a better look at the bowl-shaped vineyard hidden behind the tree line. Tip: An appointment is required to taste at Cain so be sure to call ahead! 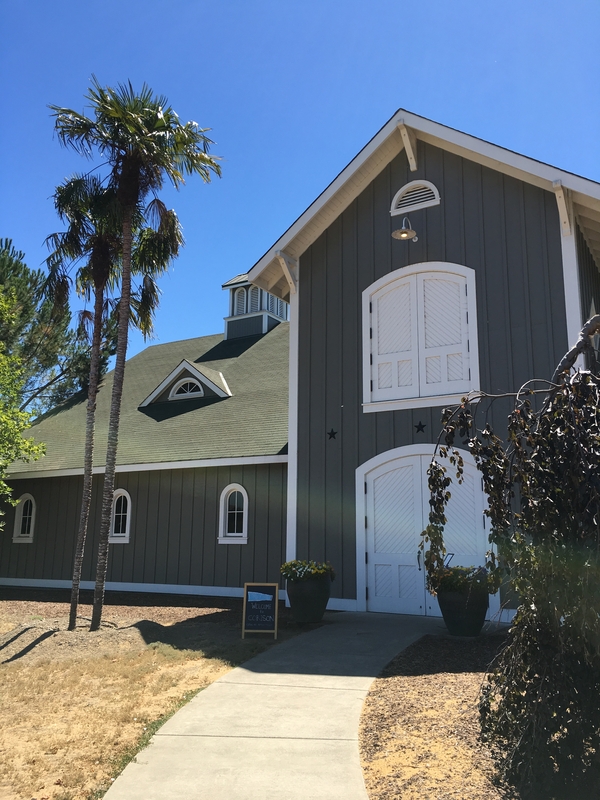 This stark white winery stands out from the California native shrubbery along the eastern side of Silverado Trail. 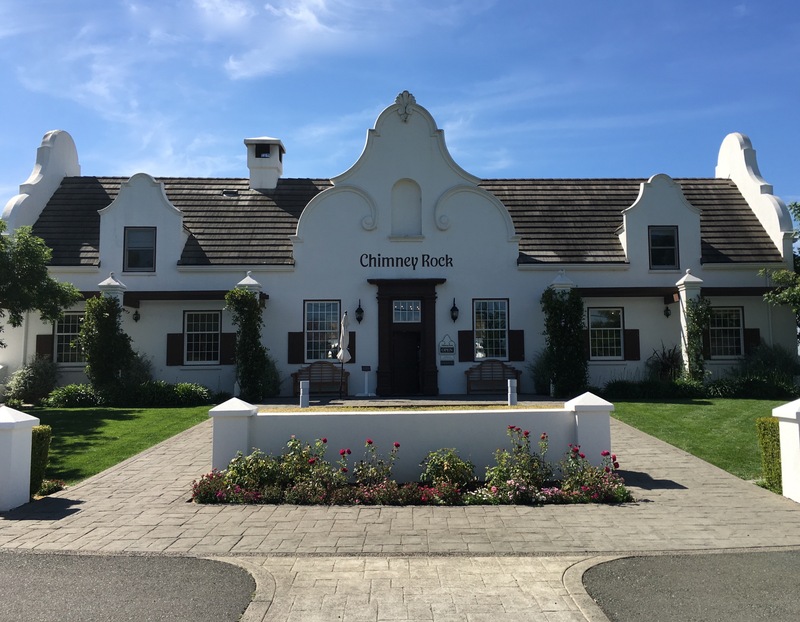 The South African Dutch colonial roof line and architectural detail are echoed in their wine labels – nice touch. The tasting room boasts a warm wood interior with a slate fireplace and an 80s throwback soundtrack broadcasting at a reasonable din. Just outside the tasting room doors is a relaxing contained patio on which visitors can enjoy their flights. We chose to stay at the bar and listen to the stories shared by the knowledgeable wine educator which included the unique history of the winery’s location and ownership. Our tasting featured wines from their three levels of distribution: straight to restaurants, small consumers, and wine club only releases. Our favorites were their 2011 Ganymede Vineyard Cabernet Sauvignon and the 2012 Chimney Rock Cabernet Sauvignon. Neither had particularly striking aromas but made up for it with layers of volcanic earth for the 2011 and cocoa and blackberry for the 2012. Don’t be surprised like we were – a two-bottle purchase will only wave one of your tasting fees. Tip: Take a look a the property map of vineyards and ask about the origin of the name “White Pebble”. Cathy Corison was one of the first female winemakers in the Napa Valley and is known for her robust style of wines. Her winery sits smack dab in the sun basket, which is the nickname for the warmer part of the valley floor in Saint Helena. Our tour and tasting included a walk in the vineyard out back, a gander at the steel tanks, and a sit-down in the barrel room. The cool, regulated climate of the barrel room provided a much-appreciated respite from the July heat. Although, as seasoned residents of Northern California, the heat wasn’t really a concern. You might feel otherwise if you visit Napa in the summer. The tasting experience occurs among the oak barrels and seems as though it was an afterthought by the winery designer. Visitors sit at make-shift bars on hard schoolhouse-style wooden stools. It was preferable to stand. We started our tasting with the only white wine that Corison makes – a 2013 Corazón Gewürztraminer. It wasn’t sweet, as you might expect, but was instead very spicy with a lemon twist. 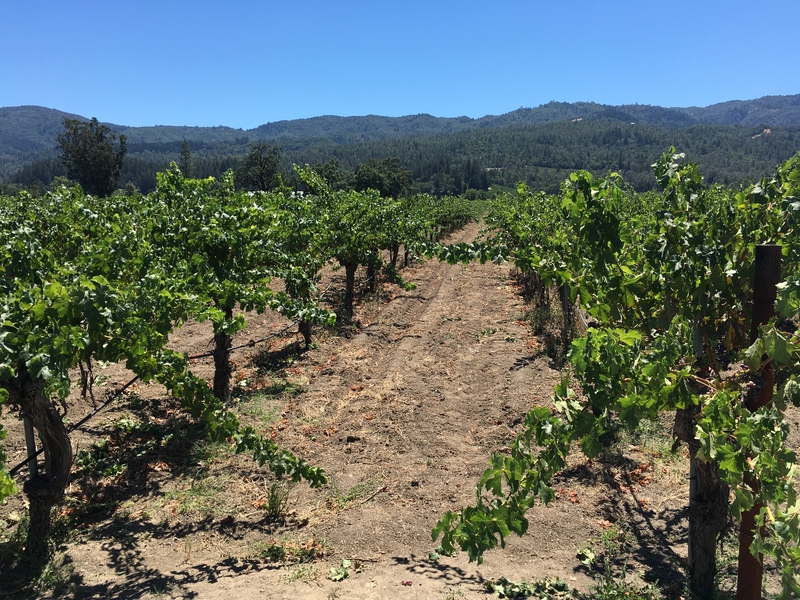 The 2013 Helios Napa Valley Cabernet Franc was softer with hints of blackberry and black cherry. 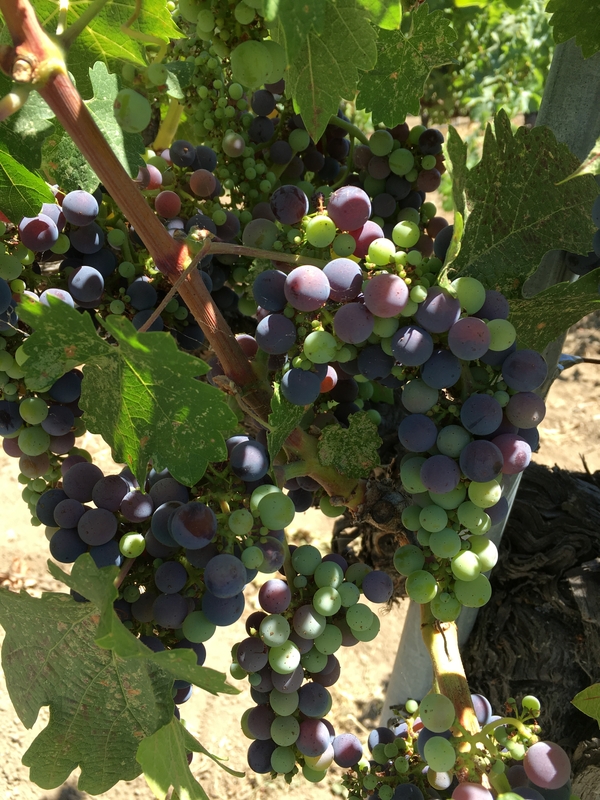 The 2013 Corison Napa Valley Cabernet Sauvignon was dry with notes of red fruit. The 1999 Corison Napa Valley Cabernet Sauvignon featured blackberry and cassis with more savory aromatics than the 2013. Our wine educator noted that Cathy’s wines take 8 to 10 years to show off. We would have to agree. Tip: Tastings are by appointment only, although we were accommodated almost immediately on the half hour. Don’t wait for your appointment though, they really do turn people away at the door.